A touch of Thai simplicity. Indelible hints of violet and ivory orchids fill the entrance. MANATHAI Hua Hin provides affordable Thai boutique accommodations for today’s globetrotter in the heart of Thailand’s beloved beach resort town of Hua Hin, located just over two hours from Bangkok. The 40-room, all-suite hotel is ideal for those who seek privacy, space and comfort. Located at in the heart of town, next to the country’s most architecturally beautiful railway station, MANATHAI Hua Hin is a convenient base from which to explore all that the region has to offer: watersports, traditional spas, world-class golf, snorkelling, lush national parks, exciting outdoor cafés and restaurants, as well as the famous night market just steps away. Or spend a lazy day chatting on the terrace, napping by the pool or relaxing on your balcony absorbing the Thai town’s charming scenes. Short Description: A touch of Thai simplicity. Indelible hints of violet and ivory orchids fill the entrance. 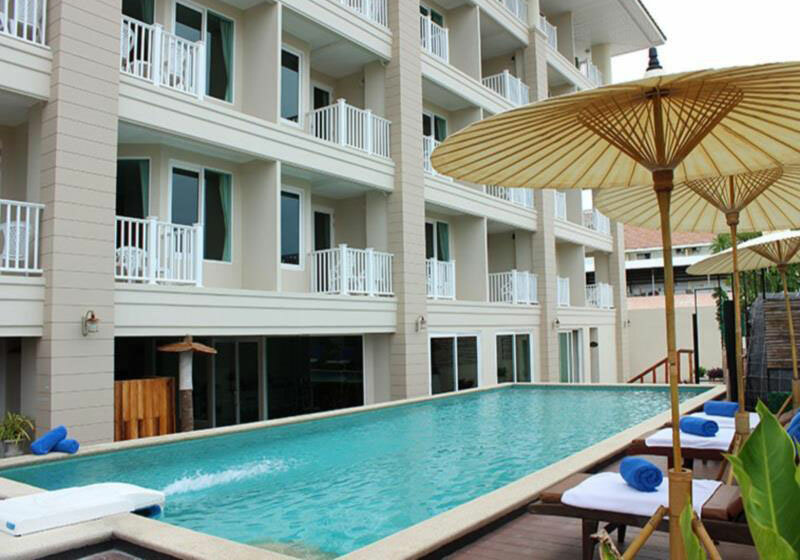 MANATHAI Hua Hin provides affordable Thai boutique accommodations for today’s globetrotter in the heart of Thailand’s beloved beach resort town of Hua Hin, located just over two hours from Bangkok.